Just four days into the job, South Korean President Moon Jae-in has already signalled a strengthening of ties with China. Just four days into the job, South Korean President Moon Jae-in has already signalled a strengthening of ties with China. Moon received a congratulatory call from Xi Jinping on Thursday—a gesture Beijing extends to few and never before to Seoul—and offered to send a special delegation to China. Reports suggest this delegation may arrive on Saturday. Mr Moon has the unenviable task of delicately balancing good relations with both Washington and Beijing. While the new president acknowledged that the US alliance is the “foundation of [South Korea’s] diplomacy and national security”, China insists that the THAAD missile system, which is the physical manifestation of this alliance, must go. China appears to have imposed a number of unofficial sanctions to pressure Seoul to scrap THAAD. These include restricting Korean pop culture imports, halting the sale of travel packages to South Korea and tacitly encouraging a popular ban on South Korean goods. 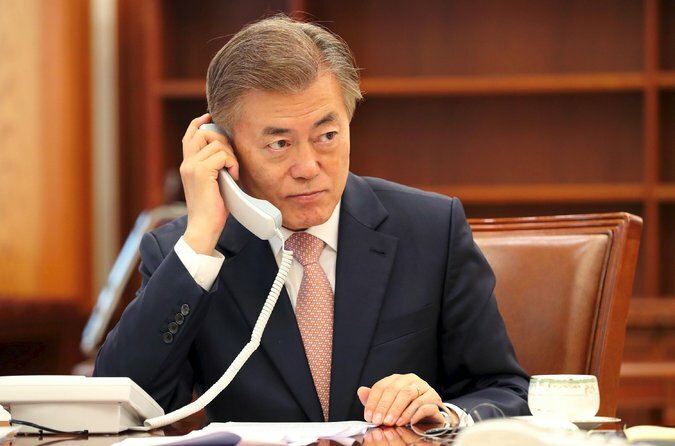 But while balancing between the US and China will put Moon’s diplomatic skills to the test, he also has a unique opportunity to calm tensions on the Korean peninsula. By strengthening ties with China, the new president may well be able to convince Beijing to increase pressure on the North to refrain from further belligerence, a feat unachievable under the staunchly pro-US Park Geun-hye.